Han Liu directs the MAGICS (Modern Artificial General Intelligible and Computer Systems) lab at the Northestern University. He has been the director of the deep reinforcement learning center at Tencent AI Lab and had been a professor at the Princeton University and Johns Hopkins University. He received a joint PhD in Machine Learning and Statistics from the Machine Learning Department at the Carnegie Mellon University, advised by John Lafferty and Larry Wasserman. His research lies at the intersection of artificial intelligence and computer systems, which deploys statistical machine learning methods on edges and clouds to achieve analytical advantages. 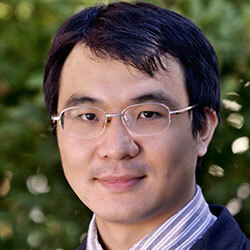 Han Liu has received numerous research awards including the Alfred P Sloan Fellowship in Mathematics, the IMS Tweedie New Researcher Award, the ASA Noether Young Scholar Award, the NSF CAREER Award, the Howard B Wentz Award and the Umesh Gavaskar Memorial Best Dissertation Award. He is now serving as associate editors for the Journal of American Statistical Association, the Electronic Journal of Statistics, the Technometrics, and the Journal of Portfolio Management. My primary research interest is modern artificial intelligence, which exploits computation and data as a lens to explore machine intelligence. To make progress, I examine this with the point of view provided by the twin windows of statistical machine learning and computer systems. Statistical machine learning provides a unified framework which combines uncertainty and logical structure to model complex, real-world phenomena, while computer systems implement the learning algorithms with the highest performance guarantees. Together they provide a powerful tool to explore complex interactions among a large number of variables, which has important applications in modern sciences. Success on this research has the potential to revolutionarize the foundation of modern data science and push the frontier of artificial intelligence. In the past years, my research group aimed to make contributions to data science and machine learning at a foundational level. For example, we have created a new research field named nonparametric graphical models, which integrates the power of probabilistic graphical model and sparse nonparametric methods. This research won the IMS Tweedie award (Awarded annually by the Insitute of Mathematical Statistics to one statistician for making excellent early-career contribution to statistical theory and methodology) and the ASA Noether award (Annually awarded by the American Statistical Associations to one researcher for excellent early-career contributions to nonparametric statistics). We also developed a model-based statistical optimization theory which provides provable guarantees for nonconvex learning problems. Our research along this line won the Best Paper Prize in Continuous Optimization in the 5th International Conference on Continuous Optimization (Awarded every 3 years to one best paper on continuous optimization). More recently, we developed a complete theory of post-regularization inference and divide-and-conquer inference for Big Data, which serves as the basis of my NSF CAREER award. We also pushed the frontier of a new field named combinatorial inference for graphical models, which aims at developing a new uncertainty assessment theory of statistical models with nonEuclidean (e.g., graphs, partitions) parameters. My earlier research along this direction has won the Alfred P Sloan Fellowship in Mathematics. Our research also won the Best Overall Paper Award Honorable Mention in the 26th International Conference on Machine Learning, the Notable Paper Award in the 16th Interantional Conference on AI and Statistics, the Best Paper Award in the National Science Research journal.